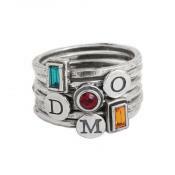 The Triple Name Ring is our best seller and one of Oprah's Favorite Things! 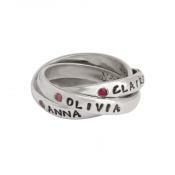 This triple band intertwined ring can be personalized with names, significant dates, or special words. It is up to you to create your custom ring! This personalized intertwined mother's name ring is hand stamped to create a unique and one of a kind rings that can be passed down for generations. What a great way to hold those you love close to you at all times, once you put it on you will never want to take it off! 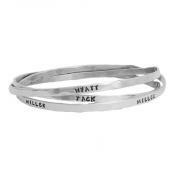 Design your name ring with three names, dates or words... use your creativity to create a piece that will constantly remind you of the special people in your life! Create a custom ring that is special to you. 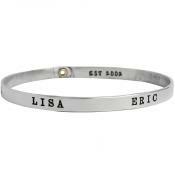 You can create a family ring and have the names of you, your spouse and your child stamped on each band. 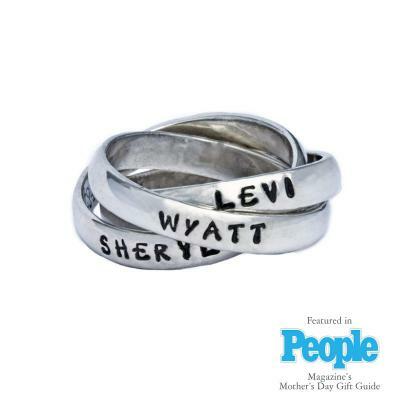 Or you can make it a Mother's Ring and stamp each of your children on the bands. Or maybe you or a friend need inspiration, you can stamp any words you want on each band that have meaning to you. Sizing: When determining your size, we ask that you give us a size that is a snug but comfortable fit. We will accommodate the size to fit the over lapping style of the bands. If you are unsure of your size, you can purchase a ring and select ring sizer from the drop down menu. We will send you a ring sizer and hold your order until we receive your size. Got this ring for my wife and she loves it. However, itâ€™s a little big but not like falling off big. She has to watch when taking gloves off and things like that. Got the ring-sizer and she was in between sizes so she went with the bigger one thinking it might be too tight with the 3 rings. So if youâ€™re reading reviews looking for help with your ring size (like we did) our advice is to get the ring-sizer and go with what it says feels best. But the rest of our experience with nelle and lizzy was excellent and if I need another piece of jewelry for my wife I will definitely check them out first.